This post may contain affiliate/referral links. It is a way for this site to earn advertising fees by advertising or linking to certain products and/or services. There is no additional cost to you, while we receive a small amount from purchases made through the links. We only link to products we personally love! 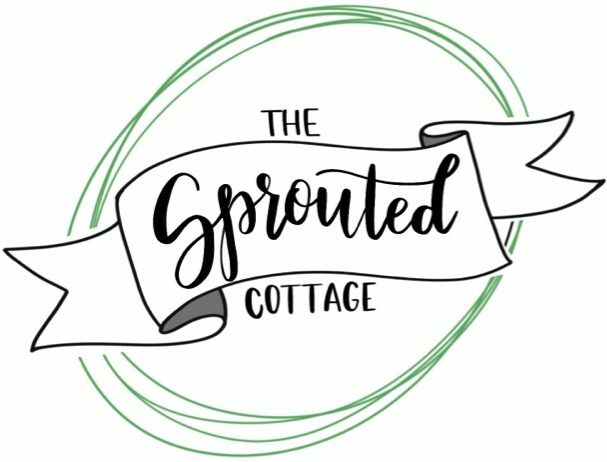 We thought we would change subjects for a bit and do our very first tutorial here on The Sprouted Cottage! Today we are going to be building a portable, “A” frame chalkboard sign. Many homesteaders and homestead enthusiasts do craft fairs, sell their farm goods, or host farm tours. Many hardware stores carry basic plastic signs that you can use to point customers to these events, but they don’t have that classic artistic style that many are looking for. Several weeks ago, Dave came home from the bakery and said that he needed more signage to direct customers into the bakery. Most people knew where The Carlton Hotel was, but they walked right past the bakery’s doors without knowing what was inside. This DIY chalkboard sign is full of charm and is a great way to attract customers to your event or business. So, I did some research into signage and what people are drawn to as well as some local laws regarding advertisement and signage for our local area. I decided to go with an “A” frame sign because it is portable, flexible for changing seasons and menus, as well as lightweight so that even the smallest employee would be able to lift and move the sign. For our area, as long as it didn’t block sidewalk traffic, we didn’t need a permit from the city to use a chalkboard sign like this. Back Porch Bakery is located inside the historic Carlton Hotel in Atascadero, California. In case you didn’t know, Back Porch Bakery has a very rustic style inside. Think brick walls, wood beams, and black metal fixtures. I wanted to keep the sign in line with these design elements to make the advertising work as an extension of the branding. This project cost about $40 but we were able to use a salvaged dry erase board as well as handles and hinges we had on hand, so expect to spend $50 if you don’t have those items lying around. NOTE: most thrift stores have dry erase boards or chalk boards. These are great options to save you money and will only require touch-up instead of making a chalkboard from scratch. Also, I’ve included links to the actual products I used. I was not paid for these items and this post is not sponsored in any way. These are my opinions and the products I purchased. If you will be cutting your wood yourself, mark and cut the 3 pickets in half so that they measure 3′ x 8″. Next cut the pine wood in thirds so that you have two 1″ x 2″ x 2’ planks. You will have one extra plank. If you’re planks are very rough, now would be the time to sand them. Ours weren’t bad so we just sanded the edges. Lay the wood pickets on a drop cloth and spray all sides with the clear coat, following manufacturer’s directions. Use two coats. Spray the two pine wood planks with your accent spray paint, following manufacturer’s directions. Use two coats. I used the hammered bronze to bring some contrasting color to the back of the sign. While the wood pieces dry, take your chalkboard and spray the accent color (hammered bronze) around the frame. Spray the frame with your accent color. Once the chalkboard is dry, carefully mask the frame. Spray three coats of chalkboard paint allowing time to dry in between each coat. Carefully mask the frame once it is dry. Allow the chalkboard paint to try before removing masking tape and paper. Lay 3 pickets side by side, making sure they match up evenly at the top and bottom. If your pickets have an angled edge like mine, just make sure all three are at the top of one side. I liked this look because it matched the “Back Porch” brand. Have a friend help you prop up the sign while you assemble it. Take your two pine wood planks and screw them to the 3 pickets using 6 screws across on each plank. The top plank should be 6″ from the top of the pickets and the bottom plank should be 6″ from the bottom of the pickets. Lay the other three pickets side by side and attach the chalkboard to the center of these pickets. I used small wood screws that I sprayed with chalk paint and just attached them in the corners and the middle edges. Have a friend hold one side while you hold the other. Attach the hinges to the two outer pickets on both sides. Attach chain to prevent sign from sliding apart and collapsing. Lastly, attach your handles just above the top wood blanks on the backside of the sign. Draw your advertisement or message! Be creative with your lettering. There are lots of inspirational posts online. Note: I used as much weather proofing and sealing steps as needed for my purpose. Our sign is under an awning, against a wall. It is semi protected from the elements and is brought in at closing time. You may need to change these steps to suit your weather and use of the sign. Did you enjoy this tutorial? Would you like to see more posts like this? Let us know by dropping us a comment below. Don’t forget to tag #thesproutedcottage online so we can see your projects! Previous Post Falling for Pickles!